StarTimes, Africa’s leading digital TV operator has announced that its App video streaming service has been officially launched in Nigeria. 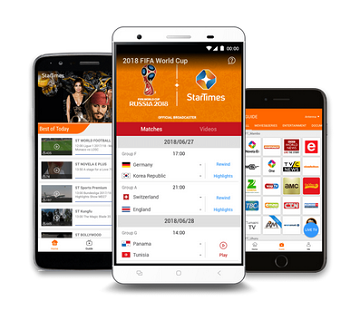 To mark the launch of the new service, the first 40,000 users can enjoy a very attractive pre-order offer for watching World Cup on StarTimes App. From 7th to 13th June, the first 40,000 subscribers will only need pay N450.00 (Four Hundred and Fifty Naira) only to subscribe to “ON Sport” on StarTimes App in order to watch all 64 World Cup matches Live and in HD, including battles of Nigeria on the pitch. The original price of the “ON Sport” service is N1500. Besides live matches, full highlights, build-ups, interviews, analysis and magazine shows will also be available with the 5 StarTimes sports channels in the StarTime “ON Sport” service. Watch 100+ Live TV channels* and catch up of TV shows, sports, news, movies, series, music, kids, documentary. Well, this is good. I love innovation, i lot of choices to choose from. One can pretty much do everything on mobile this days. A great initiative but lack of affordable unlimited data packages will hinder some many people from subscribing. What about how to buy data via glo to stream it? If u want to stream go and get ntel wawu sim.